Top weight O'Faolains Boy, trained by Pembrokeshire's Rebecca Curtis, is among the confirmed entries at the five-day stage for the Coral Welsh National at Chepstow on 27 December. 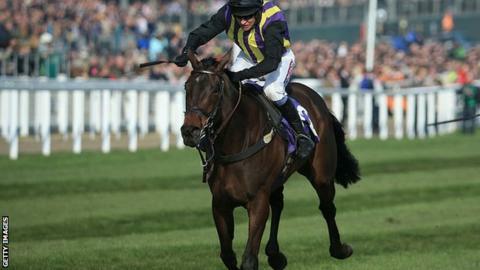 The 2014 Cheltenham festival winner returned from injury and poor form to win at Newbury last week. Curtis has three more possible runners in Bob Ford, Red Devil Lads and Audacious Plan for race. Two past winners, Emperor's Choice and Mountainous, are also in the field. Mountainous, who won in 2013, is trained by Kerry Lee, who took over the reins from her father Richard at the family's Presteigne stable in the summer. She is also represented by Russe Blanc. The Venetia Williams-trained Emperor's Choice made a timely return to action for the first time since his success 12 months ago when scoring at Haydock five weeks ago. Three of the ante-post market leaders - Jonjo O'Neill's Upswing, the Nigel Twiston-Davies-trained Cogry and Alan King's Midnight Prayer - have stood their ground. But one notable omission is Tom Symonds' Kaki De La Pree. Heading the weights on 11st 11lb are the Paul Nicholls-trained Black Thunder and O'Faolains Boy, the 2014 RSA Chase victor who returned to winning form at Newbury earlier this month. The sole Irish-trained horse left in is Folsom Blue, from Mouse Morris' yard in County Tipperary.